The first and only thing I missed when I became vegetarian almost three years ago was shredded chicken enchiladas. I don't even know if it was so much the chicken, more the texture, and the fact that it was enchiladas. I grew up eating what my family called "Enchiladas de Crema" a dish my mom made about once a week and we all loved it. They were your traditional enchiladas with shredded chicken, green chilies, and jack cheese. The sauce was thick, creamy, and filled with tomatoes. I later learned when my mom taught be how to make them before I left for college the sauce was achieved through a nice mixing of crushed tomatoes and sour cream, hence the "de crema". My dad's family is hispanic, so there's a chance these enchiladas could have been somewhat authentic (not that we would have cared) but they probably weren't. It's funny looking back on foods I ate as a child. I remember after I got married I begged my mom to track down the chicken and spinach crepe recipe I LOVED as a kid, only the find out the secret ingredient is a package of dry onion soup flavoring... And without sounding pretentious or ungrateful, some sort of veil was lifted. But alas, I chalk it up to generational food trends, because if you've ever read a cookbook from the generation before my parents it was undoubtedly filled with cups of mayonnaise, spam, and all the other wonders of the invention of processed food. Needless to say, things have shifted a bit. And I'm happy to be part of the new trend - plant-based food (which makes me wonder how ridiculous our kids will find some of the foods we eat today). 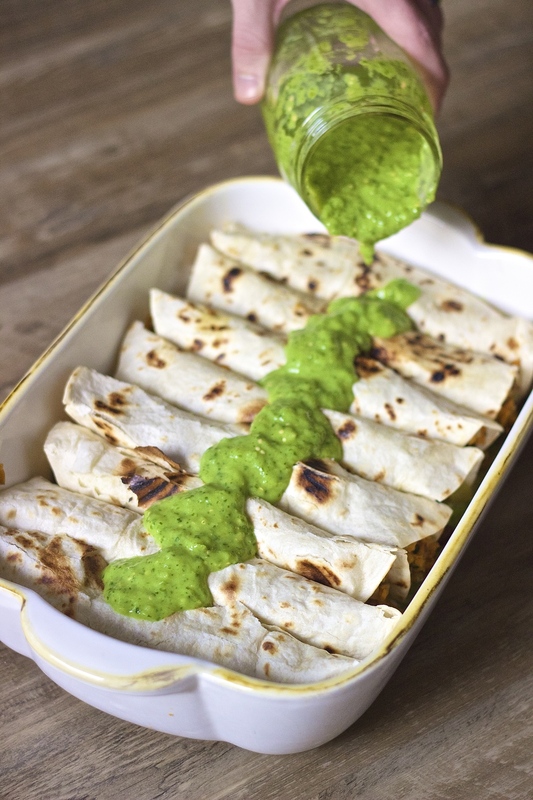 The enchiladas I make in my home now look a bit different, but haven't changed too much. 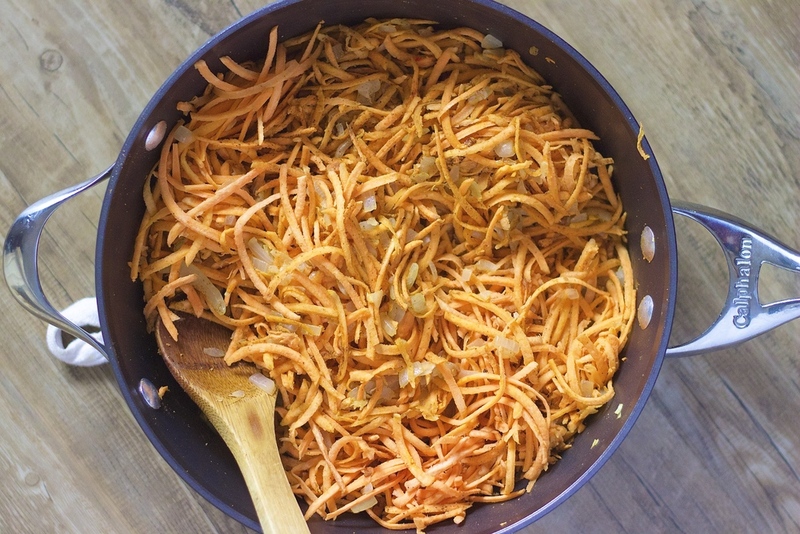 We swapped shredded chicken for shredded sweet potato, flavored with spices, lime, some onion, cilantro and jalapeño. 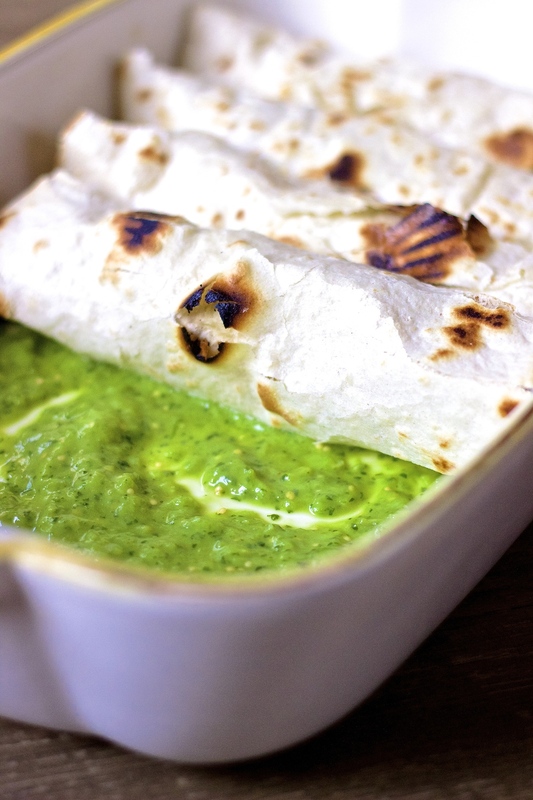 And we swapped tomato sauce and sour cream for avocado salsa verde, which might be slightly less creamy and decadent, but definitely just as delicious and much fresher. The pan of 8 still gets demolished in a day or two, if not sooner, and they're still just as homemade tasting at the ones my mom made as a kid. Prepare the salsa verde, measure out 1 1/2 cups (12 oz) and set aside. Heat a large sauté pan over medium low heat. Meanwhile, dice the onion and garlic. Add the olive oil, onions and garlic to the hot pan and cook until the onions are translucent. 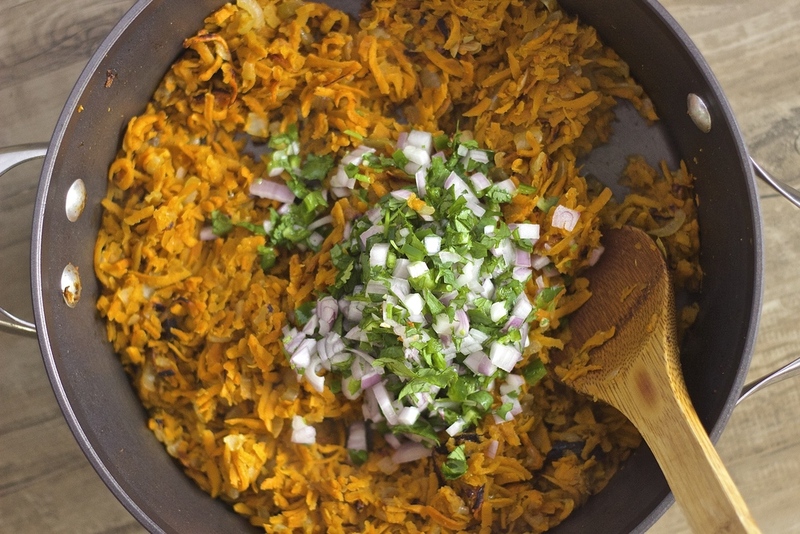 Add the grated sweet potato, coriander, chili powder, cumin, cayenne, and salt to the onion mixture and stir to combine. Cover and cook for 10 minutes, stirring several times to ensure even cooking. While the sweet potatoes are cooking, roughly chop the cilantro then add it to a small bowl with the jalapeño, shallots, and lime juice then stir to combine. When the potatoes are soft, remove from heat and stir in the cilantro mixture. Set aside to cool. Preheat the oven to 350 degrees. Pour about half of the salsa into the bottom of a 9x13 inch baking dish. Prepare the sweet potato, green chilies, black beans and goat cheese (if using) in a conveyer belt line. One at a time, crisp the tortilla over open flame (or in a frying pan if you have an electric stove) until crispy and slightly charred on each side. Transfer the tortilla to a cutting board then fill with a big spoonful of sweet potato, beans, chilies, and cheese. Roll up tightly then place seam side down in the baking dish. Continue with the remaining 7 tortillas. Once finished pour the remaining salsa on top, cover, and back for 20 minutes covered, uncover, then back for another 10 minutes. Serve with avocado & chopped cilantro. Notes: They are excellent with the avocado salsa verde, which just so happens to be the very first recipe I ever posted (I had no idea what I was doing, but was so excited to be doing it!) but to save time you could totally use 12 oz store bought sauce of your choice. If you like spicy, I'm a fan of Trader Joe's Hatch Valley Salsa. Do you ever fear that one day you will run out of creativity? That it will all just dry up in a panic and you'll be left with zero ideas. Sometimes I fear this will happen to me. Then I remember that there are restaurants and inspiration is literally everywhere. I swear one trip to Europe is enough to keep me inspired for years. The best meal I've had in a long time was vegetable risotto at Farmstead in Napa. You know something is amazing when you can't stop eating the leftovers, cold, five days later. Yeah. So good. The restaurant is as farm to table as you can get. We literally witnessed the chef walk out back to the garden, pick some herbs and return to the kitchen. Everything about this place was lovely. Including, and especially their risotto. Re-creating is has been on my to-do list for a while. And with Valentine's Day less than a week away, I think the timing is just perfect. After a couple tries it tastes spot on to the risotto I had on that cool afternoon back in October. Warning, risotto can be a bit involved, but in my opinion, it's got a worse reputation that it deserves. And should really only take about 20-25 minutes max of near constant stirring. You see, there are certain kitchen tasks that require near constant attention, like smitten's ethereally smooth hummus that requires you peel each single chickpea and homemade pasta that most normal people would totally roll their eyes at and say "you've got to be kidding me, not worth my time". Well, risotto sort of falls into that category. And you know, I think I've discovered the secret to these types of somewhat monotonous tasks. The answer is turn on a good pandora station, pouring yourself a generous glass of wine (hey, you've already opened the bottle of the risotto anyway!) and allow yourself to settle in and let it be a sensual meditative experience. It also helps if you have a partner, one person to manage the ingredients as they get added to the pot, and one to man the stirring. The result is well worth the wait. I recently followed a butternut squash farro risotto recipe which was delicious and lovely, but it barely made 3 servings, which was seriously disappointing for the amount of time and effort. I knew I didn't want that so this recipe makes a whopping 6-8 servings, though I'd say closer to 8, and also happens to re-heat beautifully. It's packed with tons of vegetables, from butternut squash to broccoli to everyone's favorite kale. And despite being a traditionally heavy winter dish, this risotto is surprisingly light and fresh with lemon zest, fresh basil, and tangy pomegranate arils. It almost feels spring-like which is sometimes refreshing in the dead of winter. Something about homemade risotto is just so special, comforting, and perfect for treating yourself or sharing with someone you love. Preheat the oven to 400 degrees. Peel the butternut squash and scrap out the center (you can save the seeds for roasting if you'd like), and dice into small cubes. Line a baking sheet with parchment paper, toss squash with oil, salt and pepper. Cook for 35 minutes. Meanwhile, peel the sweet potato and using a thinnest setting of a mandoline, slice into thin strips. Toss with oil, cumin, paprika, and salt. Line a baking sheet with parchment and place sweet potato slivers in a single layer, being mindful they don't touch, and cook at 400 degrees for about 7 minutes, watching carefully as not to let them burn. Note: both of these can be done ahead of time. Make the risotto. Heat the vegetable stock in a small saucepan over medium-low heat. Heat 3 tablespoons of butter in a dutch oven or large saucepan over medium heat. Sauté shallots in butter until soft, about 5 minutes. Add rice and stir. Add wine and continue stirring until the liquid reduces by half. Ladle about 1/2 cup of the warm stock into the rice, stirring until liquid is completely absorbed, then ladle another 1/2 cup of stock and continue to stir almost constantly. Repeat. Once about one quarter of the stock is incorporated, add in the broccoli, when about half the stock is incorporated add in the zucchini, when about three quarters of the stock is incorporated add the mushrooms. Just before risotto is finished stir in the kale. Continue with remaining stock until the risotto is creamy and al dente, I ended up using 6.5 cups total. Add roasted butternut squash, two tablespoons of butter, salt, lemon zest and parmesan and stir until warmed throughout. Remove from heat, and serve, topping with sweet potato chips, basil, and pomegranate arils. I find the water method easiest and and the least messy method for removing pomegranate seeds. Here's a video. You can really do this with any vegetables you have on hand. Just add in the vegetables that take the longest to cook soonest. Kneading Home is a celebration of good food, from fresh, simple, seasonal recipes that showcase whole foods to the occasional chocolate cake. © 2017 Nicole Buckley. All rights reserved.